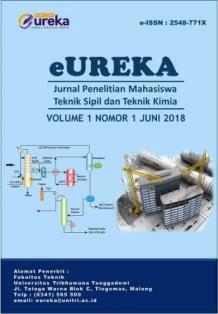 eUREKA is a scientific publication/ journal for college students that publishes articles in the field of Chemical Engineering and Civil Engineering, Engineering education and learning. Chemical Reaction, Analytical Chemistry, Biochemistry, Designing tools and chemical processes, Chemical industry process, Computing and modeling (simulation) process, Particle and nano technology, membrane technology, esessential oil technology, and phytopharmaca, etc. Analisa Kapasitas Tingkat Pelayanan Lalu Lintas Tanpa Signal pada Persimpangan Jalan Tirto Utomo Tlogomas Landungsari.